Hanukkah in the Park is back for 2017! 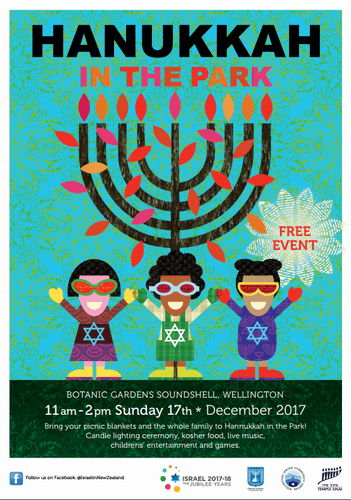 Only this year it will be held in the Wellington Botanic Gardens Soundshell on Sunday 17th December from 11am-2pm. It is going to be a fabulous, family friendly event. There will be a traditional candle lighting ceremony, klezmer music, and kosher food. There will also be a wide range of children's entertainment including Wellingtons bubbleman, balloon and face painting artists. So bring your picnic blanket and the whole family along to Hanukkah in the Park 2017!